In stock -This product will ship today if ordered within the next 6 hours and 55 minutes. Peppermint essential oil is a fresh, menthol oil with a strong, minty and cooling aroma. It has a stimulating and replenishing affect, so is useful for relieving tiredness and easing tension. Peppermint oil is extracted from the whole plant above ground. The best time for extraction is just before flowering, and the fresh or partly dried plant is used for the highest yield of good quality oil. Peppermint oil blends well with benzoin, eucalyptus, marjoram, lemon, lavender and rosemary. 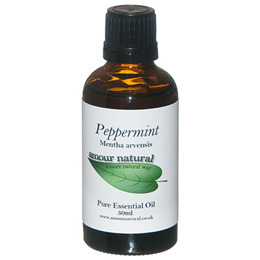 Below are reviews of Amour Natural Peppermint Pure Essential Oil - 50ml by bodykind customers. If you have tried this product we'd love to hear what you think so please leave a review.